Dozens of firefighters called to Isla Bank Mills in Keith on Tuesday night. Firefighters have tackled a large blaze at a business park in Moray. At the height of the incident around 60 firefighters were involved at Isla Bank Mills in Keith. Emergency services were called to the scene at around 7.50pm on Tuesday. 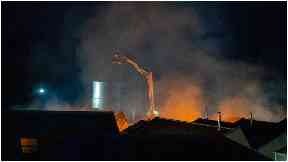 Crews from 12 appliances worked through the night to tackle the blaze. Firefighters had the fire under control just after midnight and the last appliance left the scene at 2.55am on Wednesday. There were no reports of any casualties. The building was a former textile site which was redeveloped into a business park.